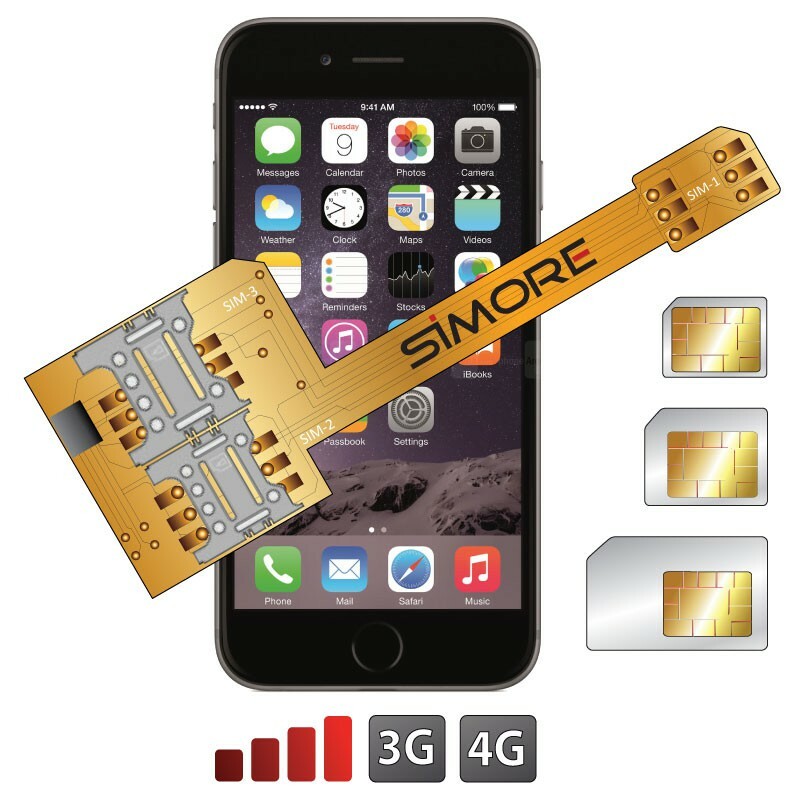 3 in 1 solution: Install and use 3 SIM cards in your iPhone 6 Plus . The Triple SIM adapter case X-Triple 6 Plus is a triple dual SIM device which allows you to have 3 SIM cards (1x nano SIM, 1x micro SIM and 1x mini SIM) in your iPhone 6 Plus. The case Triple dual SIM X-Triple 6 Plus is easy to install. The first SIM (nano SIM) fits directly into the slot of your iPhone 6 Plus and the two other SIM cards are placed on the back of your cell phone and are maintained by the external protective case. The SIMore menu appears automatically in your phone's main menu to manage your 3 telephone numbers. Call, send and receive your SMS/MMS, access your data and browse Internet using 3G / 4G with 3 SIM cards on one iPhone 6 Plus . With this tactile and ergonomic Triple dual SIM case, your mobile is fully protected while keeping all its available features (buttons, connectors and camera of your iPhone 6 Plus). For all persons who use several SIM cards, businessmen, borders or traveling, you switch between your three SIM cards depending on your desires and needs. Choose the SIM card you want to be connected. 4G and 3G Internet / data access with all SIM. Separate your business and your private life. Rename your SIM cards to know which SIM is active. Anti-shock protective case for iPhone 6 Plus.